NIT Trichy Recruitment 2019 - NIT Trichy invites Online applications for recruitment of 134 Computer Science and Engineering, Civil Engineering, Computer Applications, Electronics and Communication Engineering, Mechanical Engineering Posts. The applicants are requested to apply online only through Official Website http://www.nitt.edu on or before 28.02.2019. Interested candidates are requested to peruse the advertisement regarding the process of Examinations and Interview, Eligibility Criteria, Application Fee, How to Apply, Pattern of Examination, Syllabus, Question Paper, Admit Date, Exam Date, Result Date etc,. Refer thoroughly before applying. B.E. / B.Tech. or equivalent in CS / CSE B.E./B.Tech. or equivalent in Electrical Engineering / Electrical and Electronics Engineering Specialization: M.Tech./M.E./M.S. (by Research) / with Ph.D. in the following areas: Power Systems, Power Electronics and drives, Electric Machines / Electronics IT and M.E. / M.Tech. / M.S. (CSE/IT) or equivalent and Ph.D. in any one of the following Specializations: Theoretical Computer Science, Algorithms, Graph Theory, Distributed Systems and Computing, Cloud Computing, Computer Architecture, Databases, Data Science, Computer Networks, Software Engineering, Software Systems, Information Security, Machine and Deep Learning, Artificial Intelligence, Parallel Computing, Embedded Systems, Operating Systems, Speech and Vision, High Performance Computing. B.E./ B.Tech. in ECE or its equivalent branch of Engineering M.E./M.Tech. in Microelectronics, Applied Electronics, Embedded System, VLSI, Communication Systems, Microwave Engineering, Optical Communication, Photonics, Signal and Image Processing, Wireless Communication, Wireless Networks, Nano Technology, Bio-Medical Engineering, Computer Technology Ph.D. in areas of Microelectronics, Embedded System, VLSI, Microwave Integrated Circuits, Optical Communication, Photonics, RF-MEMS, Signal Processing, Pattern Recognition, Machine Learning, Wireless Communication, Wireless Networks, Nano Technology, Bio-Medical Engineering. On completion of filling /uploading of the on-line application form and submission, download a copy of the signed application form and enclose the Self-Attested photo-copies of the certificates/testimonials/research papers etc., and send to The Registrar, National Institute of Technology, Tiruchirappalli - 620015. 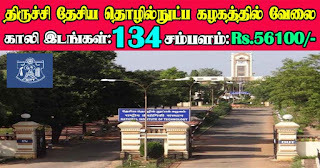 Tamil Nadu by Speed / Registered post to reach on or before 11.03.2019 by 5.00 p.m mentioning on the cover “APPLICATION FOR THE POST OF ASSISTANT PROFESSOR GRADE-II IN THE DEPARTMENT OF_____________.